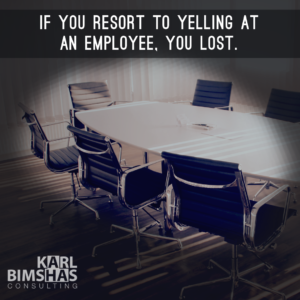 If you’re an adult entrusted with the privilege and responsibility of authority, and you regularly berate or yell at your employees, you lose. You might trick yourself into thinking it will work in the short term, but you’ve paid a heavy price. You’ve lost respect. You’ve lost long term productivity. You’ll lose revenue. When you treat another adult with less dignity than you would expect to receive from them, you’re no longer a leader. You’re not even a professional. You can’t hide behind labels and excuses. Blaming your behavior on your “passion,” or “zeal to win,” is a fools ruse. You’ve already advertised your weakness and lack of control. Make amends and then, make a plan to ensure it never happens again. If you can’t lead without yelling, you can’t lead.